Hundreds sit and wait to comment on gambling license proposals. 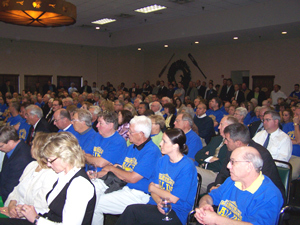 A standing-room-only crowd showed up for today’s Racing and Gaming Commission hearing in Johnston on new casino licenses. The commissioners are giving supporters from Lyon, Tama, Wappello and Webster Counties three minutes each to speak in favor or against a casino. No one spoke on either side for Lyon County as the hearing began. The first speakers from Tama County were representatives of the Meskwaki Casino in Tama. The general manager of the casino, Dan Stromer, said another casino would hurt business at the Native American casino. Stromer said if he was in the position of those wanting a new casino he would say stress — as they do — that a new casion would expand the market, create new jobs and add economic benefits. Papakee argues a second casino in Tama County would hurt their casino and their tribe. The general manager of the state-owned Honey Creek Resort spoke in favor of a new casino in Ottumwa, saying it would go well with the resort and give visitors something else to do in the area and might lead to longer stays at the resort.